Missing out on emails is obvious when the email client is flooded with numerous emails. Sending out a Text (SMS) message to your candidates informing them about the sent mail is hence a viable option. Jobsoid allows you to send out personalized text (SMS) messages to your candidates directly from their profiles. Click on Text (SMS) tab on the candidate profile. Note that this tab will be visible to you only if the candidate has provided his mobile number in his application. 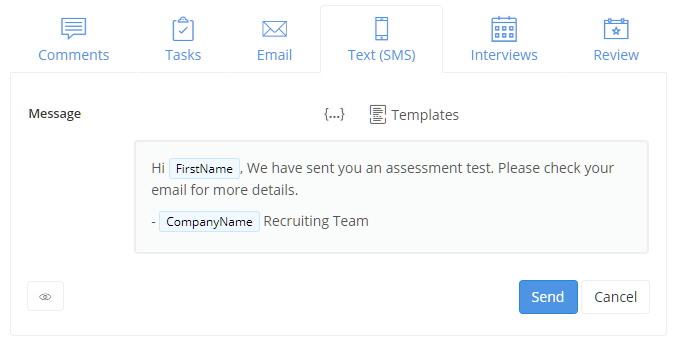 The sent message will be shown to you in the Recent Activity section on the Candidate profile.